Also serving communities of Valley Center. There are 130 Assisted Living Facilities in the Escondido area, with 39 in Escondido and 91 nearby. The average cost of assisted living in Escondido is $3,478 per month. This is higher than the national median of $3,346. Cheaper nearby regions include Poway with an average starting cost of $3,166. To help you with your search, browse the 428 reviews below for assisted living facilities in Escondido. On average, consumers rate assisted living in Escondido 4.2 out of 5 stars. Better rated regions include Vista with an average rating of 4.3 out of 5 stars. Caring.com has helped 12 families in Escondido find high-quality senior care. To speak with one of our Family Advisors about assisted living options and costs in Escondido, call (855) 863-8283. Escondido, California offers seniors so much to do from a historic downtown district to wineries and craft breweries and also a thriving arts and culture scene. If that's not enough, San Diego is 30 miles away and the Pacific Coast is only 20 minutes away. The senior community of Escondido accounts for 11 percent of the population; they have 39 assisted living facilities within city limits and 18 in the surrounding area from which to choose. Assisted living facilities in Escondido are known as Residential Care Facilities for the Elderly and are governed by The California Department of Social Services, Community Care Licensing Division. Escondido is located within San Diego County, which received poor air quality grades from the American Lung Association. With an ozone rating of F and a Particle Pollution 24-hour score of C, this city may not be well-suited for seniors with respiratory illnesses. San Diego County is a member of the AARP Network of Age-Friendly Communities, meaning that its elected leadership “has made the commitment to actively work toward making their town, city or county a great place for people of all ages,” according to AARP. Eligible seniors in California enjoy several tax benefits such as tax-free prescription medication, property tax deferrals, and the Senior Income Tax Exemption Credit. While the cost of living in Escondido is 47.7 percent higher than the U. S. average, the city is among the cheaper options in the state. This may make it a better choice for seniors on a budget. Crime in Escondido is close to the national average, with violent crime at 33.6, compared to the national average of 31.1. Property crime is just 0.2 points higher than the national average at 38.3. Due to its comfortable climate, seniors in Escondido can maintain an active lifestyle throughout the year. With highs of 88 degrees, lows of 42 degrees and 266 sunny days per year, it's an ideal place for individuals who prefer a mild climate. Assisted Living costs in Escondido start around $3,453 per month on average, while the nationwide average cost of assisted living is $4,000 per month, according to the latest figures from Genworth’s Cost of Care Survey. It’s important to note that assisted living rates in Escondido and the surrounding suburbs can vary widely based on factors such as location, the level of care needed, apartment size and the types of amenities offered at each community. Eligible seniors who need help paying for assisted living can apply for assistance programs. 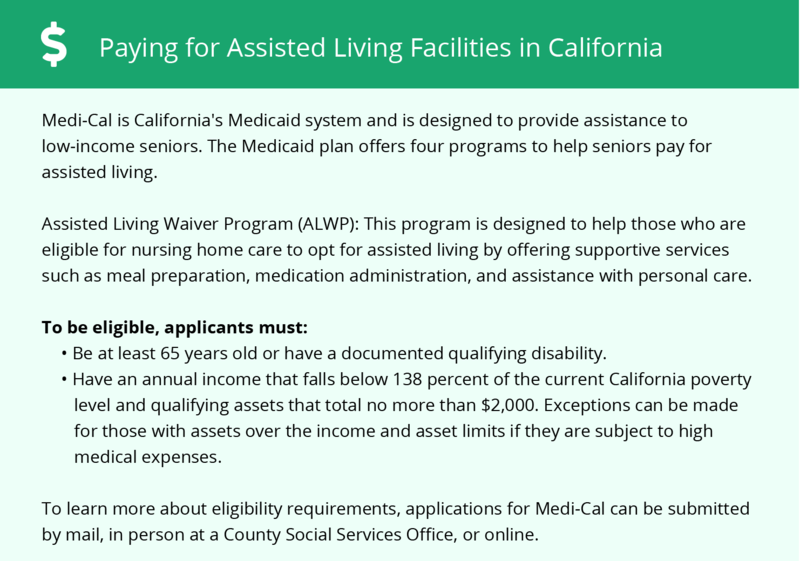 Currently, seniors can receive aid through California's Medicaid plan, Medi-Cal. 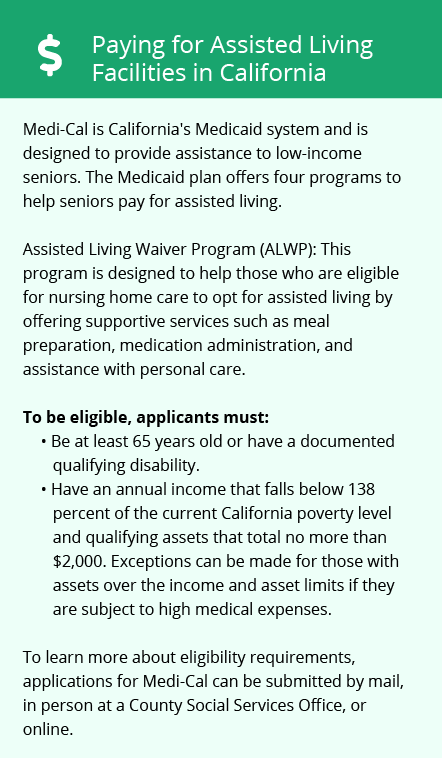 In addition to Medi-Cal, the state provides four waivers referred to as Home and Community Based Services (HCBS). Escondido and the surrounding area are home to numerous government agencies and non-profit organizations offering help for seniors searching for or currently residing in an assisted living community. These organizations can also provide assistance in a number of other eldercare services such as geriatric care management, elder law advice, estate planning, finding home care and health and wellness programs. To see a list of free assisted living resources in Escondido, please visit our Assisted Living in California page. Escondido-area assisted living communities must adhere to the comprehensive set of state laws and regulations that all assisted living communities in California are required to follow. Visit our Assisted Living in California page for more information about these laws.